Car buyers soon will be able to purchase models with auto-pilot features that allow drivers to take their hands off the wheel. DETROIT (Bloomberg) -- When Harris Poll asked Americans if they’d trust a car to drive itself, most said: Too dangerous. When told they can buy a car now that takes control of the brakes and steering wheel to avoid a collision, most said: Bring it on. The survey, conducted for Autotrader.com, is a reminder that game-changing technology is less scary when it arrives piecemeal, seeping into daily life until it becomes the new normal. Automakers are betting gradualism will ease consumers’ anxieties about ceding control of a speeding automobile to sensors, cameras and chips. Each year, bit by bit, cars will become more fully autonomous as the industry bakes “driver-assist” technology into packages of safety options. Gadgetry that five years ago seemed like science fiction is quietly becoming commonplace in a range of models, from luxury Audis to middle-market Subarus. Ty Hendrickson, 40, recently traded in an aging minivan for a Subaru Outback after meeting someone who broke his back in a rear-end accident. The $27,000 Outback automatically brakes or cuts the throttle if it senses an impending collision and sounds an alarm if Hendrickson crosses the center line or wanders out of his lane. And it’s accelerating quickly. As soon as this summer, car buyers will be able to purchase models with auto-pilot features that allow drivers to take their hands off the wheel, feet off the pedals and navigate the roads automatically. Consumers’ concerns include things like the privacy of their whereabouts and whether cars can be hacked. That’s why automakers are careful to make sure the arrival of the self-driving car is a revolution by evolution. Tesla Motors Inc. plans to release a car with “auto-steering” this summer. Cadillac has promised to debut a model next year that offers hands- free driving. Mercedes-Benz, BMW and Audi next year will offer cars that take control in a traffic jam, allowing the driver to relax and de-stress. Audi’s next generation A8 in two years will feature a “central computer brain” that instantly analyzes data coming from a variety of sensors and cameras on the car and can make snap driving decisions in traffic jams and on long trips. “So you’ve now given time back to the individual to do some thinking while behind the wheel or simply sit back and enjoy a cup of coffee,” said Anupam Malhotra, Audi’s senior manager of connected vehicles. In a year or two, some Audi, BMW and Mercedes models will drive hands-free at highway speeds, change lanes on their own and park themselves in a high-rise garage. In the past, it could take several generations of cars for new technology to trickle down from luxury to mass-market vehicles. But automakers are racing to overhaul their business models to remain relevant in a world where mobility is being redefined as most of the global population crowds into large megacities over the next two decades. Driverless cars that move in harmony like schools of fish will be essential to keep people and goods flowing safely and efficiently. The billions being poured into autonomous autos has put the development of the underlying technology -- sensors, high-speed chips, cameras -- on hyperdrive. And it’s accelerating the democratization of the technology, as carmakers stuff it into family sedans and compacts. Lane-keeping and automatic braking technology can be found on everyday models from Honda Motor Co., Ford Motor Co., Hyundai Motor Co. and others. Driver-assist packages that a few years ago went for $4,000 or more, now can be had for less than half that. The safety package on Hendrickson’s Subaru cost him $1,200. Toyota's Lexus said it will offer a suite of semi-autonomous safety features on the next RX SUV for less than $650. The new technology is far more intuitive than the complicated infotainment systems that have driven so many drivers to distraction over the years. Automatic braking and lane-keeping require nothing of drivers, though they can opt out with the press of a button. Engaging adaptive cruise control, which automatically keeps vehicles at a set distance from other cars, is very similar to turning on the traditional cruise control that has been around since the 1970s. “From a customer standpoint, the learning you need to do is not much at all,” said Audi’s Malhotra. By 2017, partially autonomous vehicles will arrive in “large numbers,” Boston Consulting Group said in a new report entitled “Revolution in the Driver’s Seat.” Going forward, automakers will add technology that gradually but inexorably takes human drivers out of the equation. The next big leap: radar and cameras working in tandem to allow cars to pilot themselves. “The camera is the eyes of the car and the radar is the ears,” said Bart Herring, general manager of Mercedes-Benz product management. Mercedes already sells a system that drives a car on the freeway at speeds of up to 120 miles per hour, as long as the driver keeps a hand on the wheel. By 2016, it will offer a hands-free system, according to BCG. 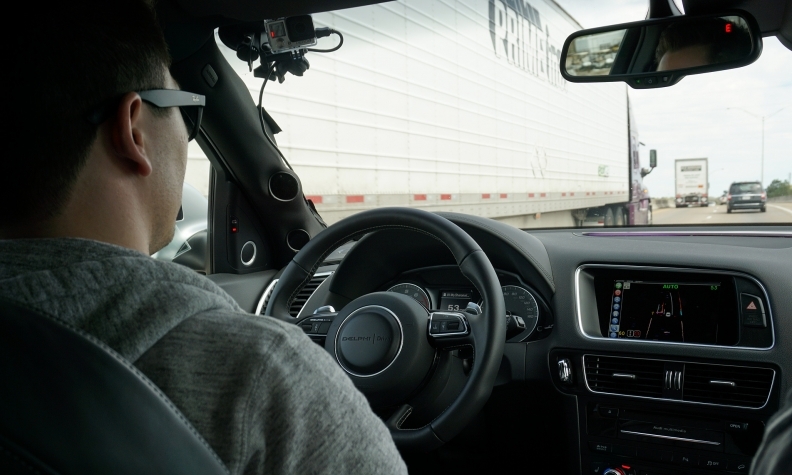 Eventually, the car itself may override the driver’s desire to take the wheel if the computer determines the human is too drowsy, drunk or doesn’t have the skills needed to navigate a difficult stretch of road, Gartner’s Koslowski said. “I think the car is going to be your friend and will look out for you,” he said. Don’t try selling that friendly future to everyone. Even Hendrickson, the early adopter with the semi-autonomous Subaru, has his fears about cars that do the driving for us. He worries that automakers aren’t working hard enough to make fully autonomous cars secure from hackers. For now, Hendrickson is blown away by his Subaru’s current capabilities and enjoys showing friends how smart his car is. They are fascinated by the cameras that look like a pair of eyes in his windshield and by how quickly the car senses trouble ahead and hits the brakes without any help from Hendrickson.